The exhibit will remain on view until Friday, May 10, 2019. 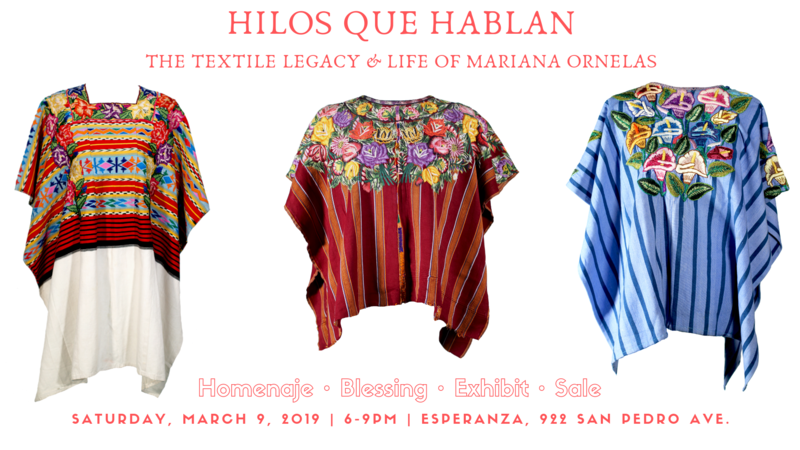 Join us on Saturday, March 9, 2019 for a day of honoring Mariana Ornelas and the beautiful textile legacy she gifted the Esperanza. Before she passed into the spirit world on March 6, 2017, Mariana Ornelas – musician (harpist extraordinaire), professor of Spanish and Mexican American Studies at Palo Alto, community activist, and former board member of the Esperanza Peace and Justice Center – donated her collection of beautiful textiles and huipiles to the Esperanza Peace and Justice Center. In honor of her life and gift, we will be having an exhibit, a ceremonial blessing, speakers, and more! The exhibit will remain on view until Friday, May 10, 2019. Huipiles are special articles of clothing usually made of organic fibers such as cotton, wool or silk is worn by indigenous women in parts of Mexico and throughout Guatemala. It represents the pueblos and cultures of specific indigenous communities and is used for daily wear with more elaborate ceremonial huipiles made for weddings or community celebrations. The colors, the symbols, and the type of weaving in each huipil speak volumes about the culture and spiritual beliefs of each indigenous community and the ties to the natural world. Huipiles exhibited for sale will include huipiles from the city of Juchitán, Tehuantepec, in Mexico that are made from heavy velvet featuring large floral imagery, and huipiles from pueblos throughout the state of Oaxaca featuring animals, plants and nature. Huipiles from pueblos of the many regions of Guatemala will feature more intricate designs and tight weaving in the tradition of indigenous weavers who have worn huipiles for centuries. Government repression and recurring political violence has torn apart communities and cultures in which textile arts are deeply rooted. It is certain that some of the weaving techniques are already lost due to widespread violence that has brought tourism and business almost to a standstill that has drastically altered cultural traditions. 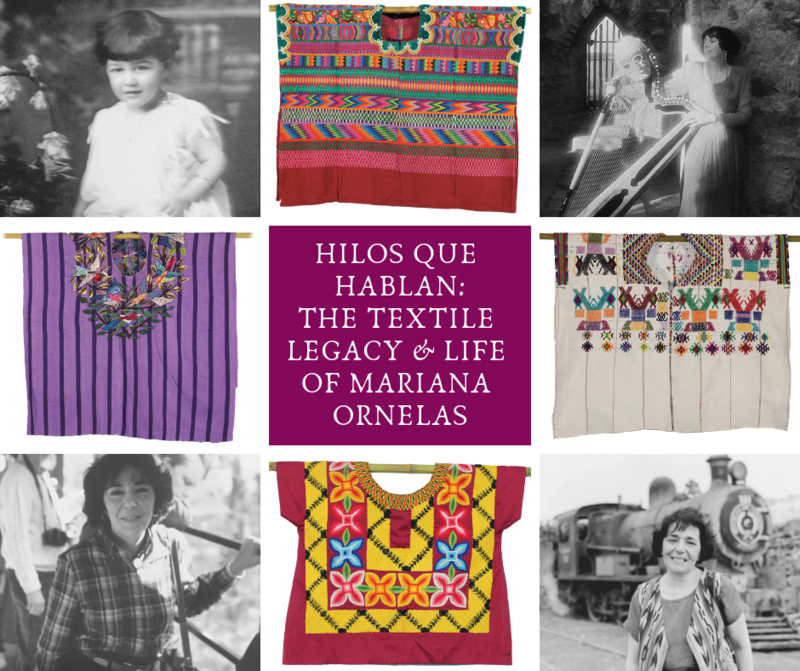 Mariana donated her collection of beautiful textiles and huipiles to help sustain the Esperanza’s cultural programs and highlight the tradition and importance of huipiles, textile work and the conditions and experiences of the people who make them. Mariana’s own interest in collecting and wearing huipiles speaks to her own sense of history and dedication to community. We hope you can join us in honoring and celebrating the life of this tireless advocate of social justice, inspiring teacher and musician who honored the art of indigenous women of the Americas. Mariana Ornelas, a professor, activist, jazz lover and harpist, died on March 6, 2017 after a long illness.Mariana Sculos Ornelas was born in Framingham, Massachusetts, near Boston, on September 18, 1949, to Greek parents. A lover of politics and an accomplished pianist, she learned while she was in graduate school that Willie Velasquez was teaching at Harvard and she set out to interview him. Her mother cooked a feast in his honor, and soon afterwards the voting rights champion invited the bilingual Mariana to work in San Antonio for the Southwest Voter Registration and Education Project (SWVRP), his voting rights organization. By then, Mariana had already lived in Mexico City and Asunción, Paraguay, studying the harp with world-class musicians, and she loved the harp as much as Flaco Jiménez, Presidential Medal of Freedom recipient, loved the accordion. Mariana sealed her ties to San Antonio as a board member of the Esperanza Center, as a neighborhood advocate, and as a member of the city’s Zoning Commission — “ground zero” of the city’s targeted real estate — where she saved neighborhoods, streets, and trees for District 1. She was a Professor of Humanities at Palo Alto College for 20 years, where she was central to the development of the Mexican-American Studies program. 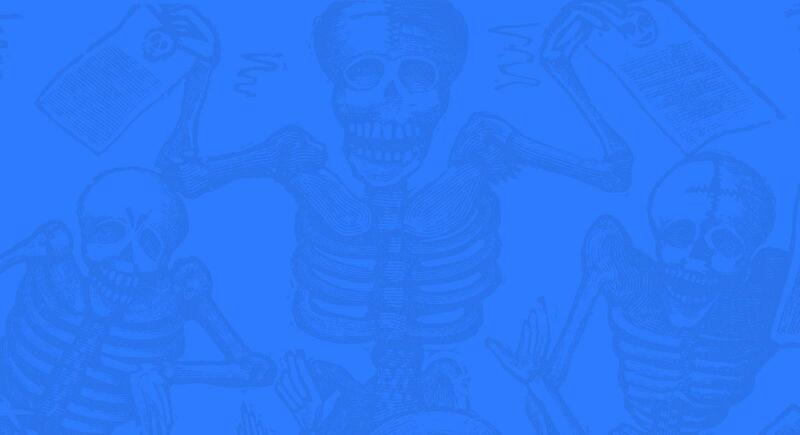 Mariana Ornelas was an only child, and had no children. But she leaves a city that will be forever listening to the strains of the “Che Guevara” song on her harp, and a more humane city because of her efforts. She leaves two cats, Midnight and Smoky, who will miss her, and legions of friends who she blessed with her advocacy, grace, compassion, and multi-culturalism. She is survived by her beloved cousin Dianne (Bill) Rockas-Leary, nieces Marina and Stephanie Leary, Uncle Constantine Rockas of Fairfax Station, VA, and Aunt Dorothea Fotis of Alexandria, VA, as well as many loving cousins in the Virginia, Maryland and Washington D.C. area. She is predeceased by her mother, Thalia G. Sculos of Woburn, MA, and her aunt and godmother, Thelma G. Rockas of Winchester, MA.